If you aren't familiar with our style of "Truck Camping", I encourage you to read my blog post on that HERE. Our brunch stop at a stormy rest area off of I-84 in Oregon. We left bright and early in the morning from Camping World and got on I-84 Eastbound. Right now, we are in "travel mode" and our plan was to get to Pendleton, Oregon and stay at the Wild Horse Casino for the night. Our usual driving routine on our Big Trip is to drive only a moderate amount each day to keep it enjoyable and comfortable. Once in a while we will put in a "long haul" day to get ourselves somewhere, but what works for us is to only go about 3-4 hours, or about 200 miles. We have found over the years that we seem to think a lot better of each other when we don't over-do-it on the driving portion. It is amazingly fatiguing. We are both not "breakfast eaters" so we always hit the road after we have coffee in the morning and then stop around 10:30 or 11 for "brunch". This keeps us at right around 2 meals per day, which is just fine when you sit in the truck for 3-4 hours! For a long time I would plan "Breakfast, lunch and dinner" and we never came close to eating all that food. Since neither one of us is "underfed" this works just fine. Upon arrival at the casino, we did what we always do, which is to check with security to verify that we are in the preferred area for RV's to park over night. 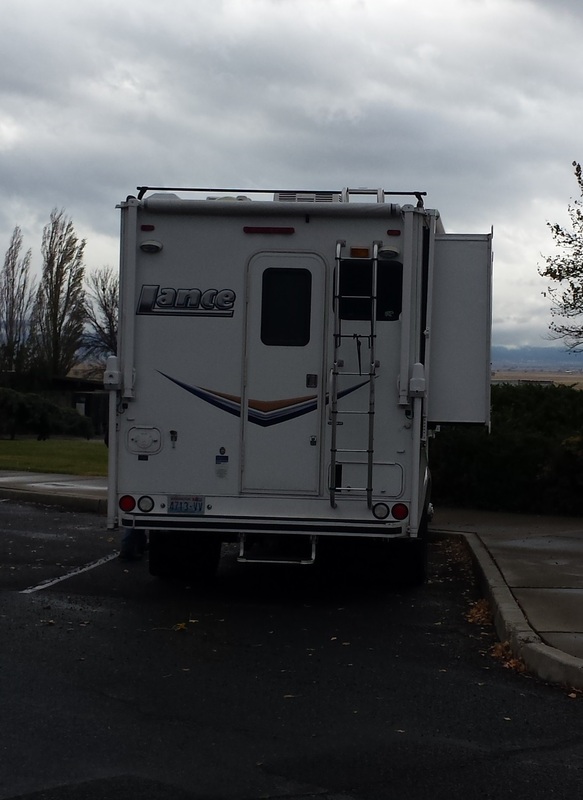 Just because there are several RV's parked, doesn't always mean that is where they would prefer you to park! With the Lance, it really doesn't matter to us, and this is never stressful because we can fit pretty much anywhere with no fuss whatsoever. I don't think we have ever arrived anywhere and we couldn't stay because it was "full". We can always fit somewhere! When possible, we orient the truck so that we will gain the most sunlight on our solar panels, and then we visit the casino for some relaxation! Now, this is the part where "free overnight parking" is - er - debatable. Usually our casino stops are the MOST expensive stops of the trip! But we love to play, this is NOT a requirement at all, although a great many casino's now require you to join their "Players Club" to use their lot overnight. There is never a charge for this, and often they will give you some "playing money" of about $5-$10 for joining. We like to laugh about one where we arrived, joined the club, stuck their $10 in a poker machine and left with $110. NOTE: This will never happen again, but that doesn't stop us from trying. We have a HUGE stack of "Players Club" membership cards, and if someone ever raids our camper, they will assume we are gambling addicts! Actually, we have a "casino jar" that has our "allowance" in it. I admit, it leaves the jar faster than it goes in! We always do observe the "RV Good Neighbor Policy" when parking anywhere there are others around, which means we do not run our generator between the hours of 10 PM and 8 AM. It is not always easy for people to do this, especially this time of year in the colder states when the air gets downright chilly at night and there isn't much sunlight to charge your batteries if you are lucky enough to have solar. (Ok, I know, LUCK has nothing to do with it.) It seems like there are always people parked that either don't KNOW about the "RV Good Neighbor Policy" or have decided it doesn't apply to them. I always try to be diplomatic and assume they DON'T KNOW about it... This saves us stress, because otherwise I would probably do something I would regret, and it would ruin our trip if, for example, I was in jail. While we are on the topic of "Boondocking" or "Dry Camping" in the colder seasons, it's a good time to talk about some of the tricks we use to make life more comfortable (and our neighbors happier) when we RV. There is much more to consider besides just the obvious: heat and light. MUCH more. Eating, for one. Now, when we got to the Wild Horse Casino in the late afternoon, it was getting dark, it was getting chilly out, and the wind was HOWLING outside. Happily, our Lance is completely storm proof, and we stay nice and cozy inside. Additionally, we have installed a radiant, propane-powered heater for almost FREE heat and we have a nice, warm flannel sleeping bag on our bed. That's a good start. Soon after getting set up (which takes about 3 minutes) our thoughts turn to EATING! Of course, we could eat in the Casino, and sometimes we do, but usually not. I mean, I would rather put that money through my favorite slot machine!! Meal prep is a large part of RVing, especially when you take extended trips, because eating at restaurants can add up quickly to the point where you would have saved money by going on a world tour on a cruise ship. We eat very simply, but we eat well. We often use our little grill, but on days like this, with it raining, windy and cold, grilling was that LAST thing we wanted to do. That means cooking indoors, and THAT means you need a method that is energy-friendly. It's all about meal planning, and there is SO much you can do here! You can read my blog post about simple meal planning in more detail: CLICK HERE. The microwave, while fast, requires the use of the generator. Not always possible, depending on where you are and what time it is. I would never rely on the microwave, for example, to prepare my morning coffee, because we have our coffee MUCH earlier than the "RV Good Neighbor Policy" would allow us to. I have a very sturdy, serviceable tea kettle that I use for boiling water on the propane cooktop. It's fast, efficient and I can always create hot water in about 5 minutes. Another tool I love is my "Thermal Cooker". Dinner is cooking literally while we travel. That means, when we stop for the night, we enjoy a leisurely glass of wine or a cocktail and then dish up dinner. No scrambling to cook! It's lovely. Another consideration: Clean up. Washing the dishes takes a LOT of water and holding tank real estate. First of all, limit the number of entrees in your meal to only one or two at the most. One-dish-meals shine here. Think stews, casseroles, chili, stuff like that. Take advantage of the bliss of paper plates and sturdy plastic silver wear. Write the expense of them off as "maid service" and consider that the cost of heating all the water and the extra hassle (and sometimes expense) of more holding tank dumping quickly puts that argument to rest. When you clean whatever cooking vessel you are using (and hopefully it is just one) then the first thing you do is completely empty it into the garbage and WIPE IT CLEAN with a paper towel. This keeps nasty food debris out of your sink drains and uses much less water. Then, grab your tea kettle which might still have warm water in it, pour a bit in the vessel and a few drops of DAWN dish soap. This is the BEST dish washing soap out there, because it dissolves grease both in your pot AND in your sink drains and hoses. If it's VERY difficult to clean, then put a lid on it and bring the dishwater to a boil and let it sit either while travelling (if you can) and agitate itself clean. Every bit of water you DON'T use is going to make your trip that much better. Put a bottle of hand sanitizer in the bathroom instead of using the sink every time. Germs just need to be killed, not rinsed off! This saves a HUGE amount of water and tank space all by itself. We only drink bottled water when we are on extended travel because it's simply too risky, in our opinion, to assure that the water you are putting in your tank from who-knows-where is clean enough for safe consumption. Don't risk it, if you ask me. Bottled water is very inexpensive compared to the horrible illness you can get with just ONE bad fill up somewhere. Consider that there could have been ANY kind of hose attached to the water bib you are connecting to, a black tank flush hose.... Eeek! Well, that's all for today. Tune in for more as we head toward Idaho and then Utah! Please subscribe to our blog or @RomanyLife twitter account so you won't miss anything! BIG TRIP 2015! We Launch!